When do I need EncryptPad? When can I not use EncryptPad? What is an EncryptPad key file? Does EncryptPad store passphrases in the memory to reopen files? Multi-platform codebase: it has been compiled on three popular operating systems and can be adapted to more. Portable: simply copy the executable to a memory stick or a network drive and use on all your computers. Simple to use: EncryptPad is a text editor and an encryption tool for binary files but it saves encrypted, compressed and integrity protected files. Open source with concise codebase: you can read the code or ask somebody you trust to read it for you to ensure that there are no back doors and your information is safe. OpenPGP file format: you can encrypt a file with another tool (gpg for example) implementing the format and open it with EncryptPad and vice versa. Double protection: randomly generated key files in addition to passphrases. You have a file containing sensitive information such as account names, passphrases or IDs. It is stored on an unprotected media or you can't control who accesses the file, whether it is located on a computer at work, a laptop while on the move, a memory stick or a cloud drive. You need to send an encrypted file to somebody with whom you prearranged a shared secret (a passphrase or a key file). In this case, you need to exchange the secret personally (not via an accessible Internet protocol) for the protected file to be decrypted by the recipient. You store or receive a file and need to ensure that it has not been tampered with or corrupted during transmission. EncryptPad uses SHA-1 hashing algorithm to verify the data's integrity. You need protection against a brute force attack in case your storage gets in somebody's hands. EncryptPad allows to generate a key and store it separately from encrypted information. The unwanted person would need two secrets to open an encrypted file: the passphrase and the key. Consider this example: you store your encrypted file on a memory stick, and protect it with a passphrase. In addition to that, you protect the file with a file key and store the key on computers where you open the file. If the memory stick is lost, the passphrase is not enough to decrypt your information. The key file is also needed and it is not on the memory stick. You need to send a file to somebody with whom you have not prearranged a shared secret (a passphrase or a key file). In this case, you need asymmetric encryption with public and private keys. Fortunately, there are many convenient tools suitable for the task. EncryptPad is not effective on a computer infected with spyware or a virus. Do not use it on a public, shared or compromised computer if you do not trust its safety. IMPORTANT: Before using EncryptPad ensure that it is legal in your country to use encryption ciphers that EncryptPad provides. You may find useful information at cryptolaw.org. IMPORTANT: If you forgot your passphrase or lost a key file, there is nothing that can be done to open your encrypted information. There are no backdoors in the formats that EncryptPad supports. EncryptPad developers take no responsibility for corrupted or invalid files in accordance with the license. The format is determined by an extension of a file. Main extensions of encrypted files are GPG and EPD. This file type conforms to OpenPGP format and it is compatible with other OpenPGP tools. Use it if you need to open a file where EncryptPad is not available. The format does not support double protection (key file + passphrase). So you need to choose between key file or passphrase and cannot use both. In addition, it cannot store file key path in the encrypted file. It means that every time you open a file encrypted with a key file, the application will ask you which key file to use. EncryptPad specific format. Other OpenPGP software will not be able to open it unless the file was only protected with a passphrase. If passphrase only protection was used, the file is effectively a GPG file (see GPG section above). However, when a key file protection is involved, it is a GPG file in a WAD container. See the following chapter for details. * Key file location is persisted in the header of an encrypted file so the user does not need to specify it when decrypting. In symmetric encryption the same sequence is used to encrypt and decrypt data. The user or another application usually provides this sequence in the form of an entered passphrase or a file. In addition to entered passphrases, EncryptPad generates files with random sequences called "key files". When the user creates a key file, EncryptPad generates a random sequence of bytes, asks the user for a passphrase, encrypts the generated sequence and saves it to a file. The format of the file is OpenPGP. Other OpenPGP implementations can also create and open EncryptPad key files as below shell commands demonstrate. When EncryptPad generates a new key file, it is roughly equivalent to the following gpg2 command. pwmake generates a random sequence, which gpg2 in-turn encrypts. It will ask for the passphrase to encrypt the sequence. The first gpg2 process decrypts foo.key and directs it to descriptor 0 of the second process through a pipe. 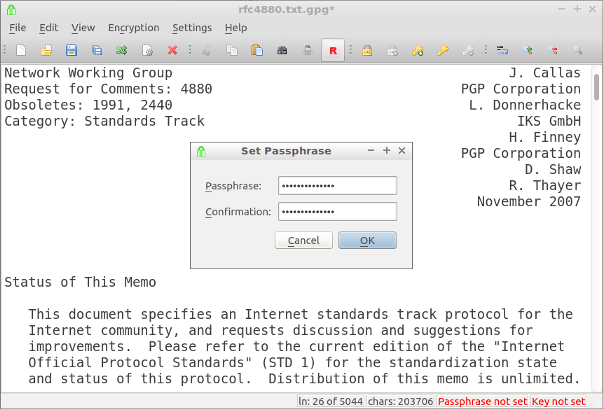 gpg2 reads the sequence from the descriptor with --passphrase-fd 0. As you see, other OpenPGP implementations can also use EncryptPad keys. Passphrase only (passphrase is used to protect a file but no keys are specified). The file is an ordinary OpenPGP file. __X2_KEY is a plain text file containing the path to the key if "Persistent key location in the encrypted file" is enabled. Otherwise, it has zero length. Protected with passphrase and key. The resulting file is an OpenPGP file containing a WAD file as explained in 2. If CURL URL is specified in Key File Path field in the Set Encryption Key dialogue, EncryptPad will attempt to start a curl process to download the key from a remote host. If you want to use this feature, you need to set the path to the CURL executable in the EncryptPad settings. Copies the encrypted file into a WAD file together with the unencrypted HTTPS or SFTP URL to the key file containing authentication parameters. Encrypts the WAD file from point 2 with the passphrase. If this file gets into the hands of a wrongdoer, he or she will need to brute force the passphrase first to be able to obtain the key URL and the authentication parameters. Since a brute force attack takes a lot of time, the user will be able to remove the key or change the authentication so the previous parameters become obsolete. EncryptPad stores unencrypted text in memory. If a memory dump is automatically taken after a system or application crash or some of the memory is saved to a swap file, the sensitive information will be present on the disk. Sometimes it is possible to configure an operating system not to use a dump and swap files. It is a good practice to close EncryptPad when not in use. # generate a new key and protect it with the passphrase "key". # encrypt plain_text.txt with my_key.key created above. Portable binaries are available for Windows and macOS. They can be copied on a memory stick or placed on a network share. Use fingerprints to receive gpg keys for EncryptPad and Botan. pacaur installs botan-stable automatically as encryptpad dependency. Alin Andrei from webupd8.org kindly created EncryptPad packages for several distributions. See instructions below on how to install them. Use the commands below to install the packages. Below are steps to verify the SHA-1 hashes of the source files in Launchpad webupd8 PPA used for building the packages. Ideally, you need to be familiar with the PPA concepts. 1. Download one of the changes files below depending on your distribution. The package version was 0.3.2.5 at the moment of writing. Please replace it with the latest version you are installing. 6. Compare the "changes" file for your distribution with the file from step 1. The SHA hashes should match. Qt framework based on MingW 32 bit (the latest build has been tested with Qt 5.3.2). MSYS: you can use one bundled with Git For Windows. You probably use Git anyway. Python: any recent version will work. Modify the session PATH environment variable to include the Qt build toolset and Python. mingw32-make, g++, qmake, python.exe should be in the global search path in your Git Bash session. I personally modify bash.bashrc and add a line like PATH=$PATH:/c/Python35-32:... not to pollute the system wide PATH variable. Extract the EncryptPad source files to a directory. The Makefiles system uses uname to identify the OS and platform. You may need to modify uname parameters in ./deps/makefiles/platform.mak to make it work. See Makefiles documentation and configure.sh script if you have any problems. Note that if you want EncryptPad to work as a single executable without dlls, you need to build Qt framework yourself statically. It takes a few hours. There are plenty of instructions on how to do this in the Internet. The most popular article recommends using a PowerShell script. While it is convenient and I did it once, sometimes you don't want to upgrade your PowerShell and install heavy dependencies coming with it. So the next time I had to do that, I read the script and did everything manually. Luckily there are not too many steps in it. No, it does not. After being entered, a passphrase and random salt are hashed with an S2K algorithm. The result is used as the encryption key to encrypt or decrypt the file. A pool of these S2K results is generated every time the user enters a new passphrase. It allows to save and load files protected with this passphrase multiple times without having the passphrase. The size of the pool can be changed in the Preferences dialogue. The latest version at the moment of writing has this number set to 8 by default. It means that you can save a file 8 times before EncryptPad will ask you to enter the passphrase again. You can increase this number but it will have an impact on the performance because S2K algorithms with many iterations are slow by design. All EncryptPad related downloads are signed with the following OpenPGP key. I also have a code signing certificate issued by a certification authority (CA). To establish a connection between my CA certificate and the above OpenPGP key, I created an executable signed with the CA certificate containing fingerprints and the OpenPGP key. You can find ca_signed_pgp_signing_instructions in downloads. Effectively I created a bridge of trust between my CA certificate and the OpenPGP key. EncryptPad is based on the OpenPGP standard and promotes it. OpenPGP signing is more flexible. There is no yearly CA certification running cost. Download packages and their detached OpenPGP signatures. Import the EncryptPad (Releases) key to your GPG keyring. Ensure that it is the valid EncryptPad (Releases) key by checking its fingerprint with ca_signed_pgp_signing_instructions. Verify signatures on the downloaded files with GPG. EncryptPad is free software: you can redistribute it and/or modify it under the terms of the GNU General Public License as published by the Free Software Foundation, either version 2 of the License, or (at your option) any later version. EncryptPad is distributed in the hope that it will be useful, but WITHOUT ANY WARRANTY; without even the implied warranty of MERCHANTABILITY or FITNESS FOR A PARTICULAR PURPOSE. See the GNU General Public License for more details. If your question is related to EncryptPad, send it to the mailing list: encryptpad@googlegroups.com linked to the public discussion group.